H.E. Dr. Hanan Mohammed Al Kuwari, Minister of Public Health, and H.E. 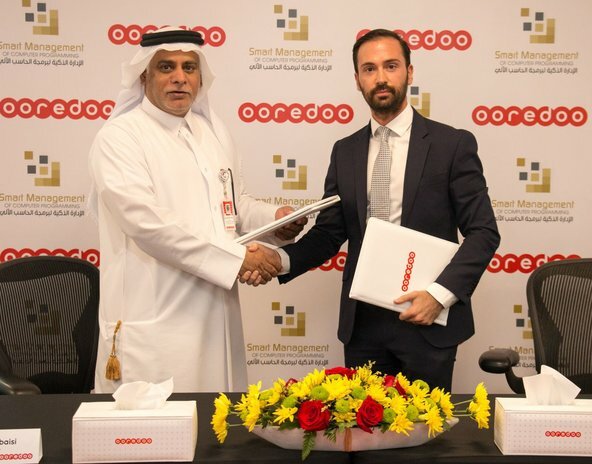 Sheikh Abdulla Bin Mohammed Bin Saud Al Thani – Chairman of the Board of Directors at Ooredoo – signed an agreement last Tuesday between the Ministry and Ooredoo, agreeing the supply of an electronic system for the control of communicable diseases and the registration of vaccination for both children and adults in the State of Qatar. Through the electronic system, all health facilities in the State will be connected with the Ministry of Public Health, with the system allowing for the reporting of cases of communicable diseases and the registration of vaccinations, taking into account the full confidentiality of patients. Implementation of the system will be in two phases. The first will link the electronic system with existing certified electronic medical records in all government health facilities, while the second will connect other private and quasi-governmental health centres to the system. The aim of such connection is both to monitor and control the spread of communicable diseases and to ensure registration of vaccinations. H.E. Dr. Hanan Mohammed Al-Kuwari, Minister of Public Health, explained the electronic system will help strengthen the capability of the Ministry of Public Health to effectively monitor, manage and respond to health challenges, providing daily and weekly data on high-priority diseases in order to be able to take necessary preventative measures in a timely manner to maintain the health of the population. The system will also allow the identification of vaccination patterns, consumption rates and vaccine stocks in the country. Her Excellency stressed that the strengthening of health protection in Qatar is a key priority identified in the National Health Strategy, to ensure the provision of healthy living and working conditions for citizens and residents, and enable the prevention of communicable diseases and disease epidemics. The electronic system will contribute to both aspects of healthcare in Qatar, as well as working towards the national strategic goal of developing and implementing real-time systems to ensure compliance with international health regulations for monitoring and responding to medical issues. This includes support for the preparation for mass events in Qatar such as the 2022 FIFA World Cup. The new national electronic system for the control of communicable diseases and the registration of vaccinations in the State of Qatar is one of a number of important projects contributing towards the implementation of the national strategy for electronic health and data management. The e-system contributes to a number of key health objectives; improving the functioning of the public health service system for basic services, improving the Ministry’s ability to collect health information to meet future needs of the community and the population, and ensuring the public health service is capable of meeting any challenges and mitigating any consequences.